I am seeking community involvement in an exciting new music performance project Pursuit for the Opening of Mona Foma in Hobart on January 9th. 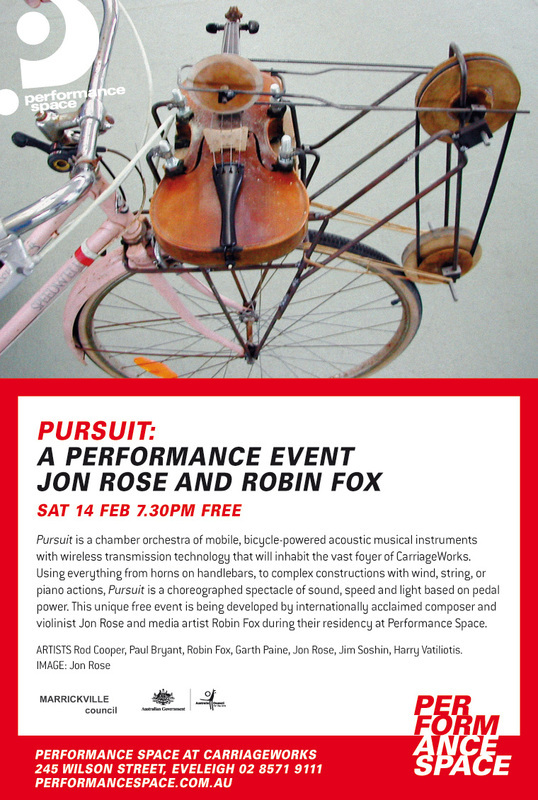 Acclaimed artists Jon Rose and Robin Fox are bringing together a pedal powered orchestra with some specially built bicycle instruments, to create a soundscape in the Mona Foma festival hub for the opening weekend. You can be involved in a number of ways, from riding your bicycle in the performance – as part of the Unlikely Orchestra (ringing bells, horns or singing)- to participating in workshop builds of new bicycle instruments to be included in the performance. We would love to include cyclists from all over Tasmania in this performance. I have not got a lot of time to spare but if any one needs help welding or brazing a contraption together let me know.